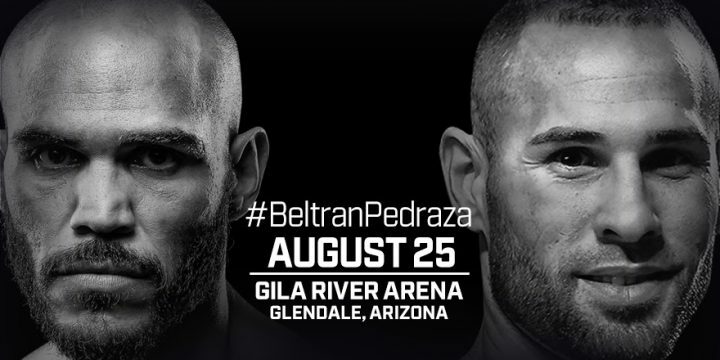 By Jim Dower: Raymundo Beltran defends his WBO lightweight title against Jose Pedraza and WBO super bantamweight champion Isaac Dogboe faces Hidenori Otake this Saturday night on Top Rank Boxing on ESPN at Gila River Arena in Glendale, Arizona. The fight card starts on ESPN at 10:30 p.m. ET/7:30 p.m. PT. Beltran vs. Pedraza is the main event on the card. Beltran-Pedraza is a 50-50 fight that can go either way. These are two fighters that have an equal chance of winning. Beltran has the punching power while Pedraza has the youth ad boxing skills. Beltran (35-7-1, 21 KOs) makes his first defense of his World Boxing Organization 135 pound title against former IBF super featherweight belt holder Jose Pedraza (24-1, 12 KOs). The 37-year-old Beltran won the vacant WBO belt on February 16 in beating 40-year-old Paulus Moses. The WBO didn’t make it difficult for Beltran to win their WBO lightweight title by having him fight Moses rather than one of the talented lightweights like Ryan Martin, Luke Campbell or Yvan Mendy. “Pedraza is a very good fighter and I am psyched for a tough fight,” Beltran said to ESPN Deportes. ”I do not trust anything, because he is a fighter who is a left-handed fighter. He is a stylist but he also likes to throw punches. I expect a complicated fight and I will not trust myself, because if I do things will go wrong, and until now we’re doing well, I even feel better than when I won the championship,” Beltran said. Pedraza, 29, has a good chance of winning this fight, as he possesses a lot of talent, a great jab and excellent boxing skills. Beltran, 37, is more of a slugger, who hasn’t faced many pure boxers during his career. It’s been four years since Beltran fought a good boxer in Terence Crawford in 2014. Beltran lost to Crawford by a one-sided 12 round unanimous decision. Pedraza only has one career defeat in losing to Gervonta Davis by a 7th round knockout in January 2017. Pedraza has come back from hat loss in winning his last two fights in defeating Antonio Mora and Jose Luis Rodriguez. Pedraza barely won his last fight in defeating Antonio Mora by a narrow 10 round unanimous decision on June 9. Pedraza is ranked #2 with the WBO, just below #1 WBO Roman Andreev. In the co-feature bout, unbeaten WBO super bantamweight champion Isaac Dogboe (19-0, 13 KOs) makes his first defense of his recently won WBO 122 pound title against #6 WBO Hidenori Otake (31-2-3, 14 KOs). The 37-year-old Otake hasn’t lost a fight in four years since being beaten by Scott Quigg by a one-sided 12 round unanimous decision in 2014. Otake has won his last nine fights, but he’s been facing weak opposition. Putting the soon to be 38-year-old Otake inside the ring with Dogboe is almost unfair, because he’s not going to be able to handle the punching power, youth and skills of the younger fighter from Ghana. This fight has mismatch written all over it. Dogboe vs. Otake is a car crash waiting to happen. Otake is so out of his league. This fight is almost unfair because of his over-matched Otake is. Unless Dogboe takes it easy on Otake, this fight is going to be over with very early.